Puppyhood is the stage of the life your puppy when he needs plenty of the best dog food around. He is not likely to be picky with what he eats but this doesn't mean that he doesn't need a properly balanced diet. Puppies only get their nutrition from what you feed him and at this stage in their life, they need all the nutritious food they can eat. The best dog food should be food that nurtures his growing body further, it should also be the kind that gives him all the energy that he needs to sustain playtime. • There are three stages of dog life: puppy, adult, senior. Feed your pet with food appropriate for his stage of life. • In the first few weeks your puppy is normally fat but if he continues to be this way after 3 1/2 months, you must restrict his diet or you'll end up with an overweight dog. • Once you find what your puppy likes, stick with it as their stomachs are sensitive to changes in diet. • Consider your budget, feed your puppy with the best dog food that is nutritious and within your budget. • Choose food that is formulated for puppies, you can't feed your pet cat food since cats have different dietary requirements than dogs. • His food should also come with a recommendation from your vet and must be specific to his breed. It shouldn't contain more than 25% protein and must be devoid of fillers because you will be feeding him more to compensate for the lesser amount of nutrients present in the food. • You might be tempted to feed him table scraps. This is not recommended as human food may contain ingredients that do not sit well with a puppy's digestive system. • Many vets and dog breeders recommend that in choosing the best dog food you take a close look at the ingredients. High-quality dog food should list the following as its main ingredients: eggs, meat, and fish printed on the labels with their corresponding weight. 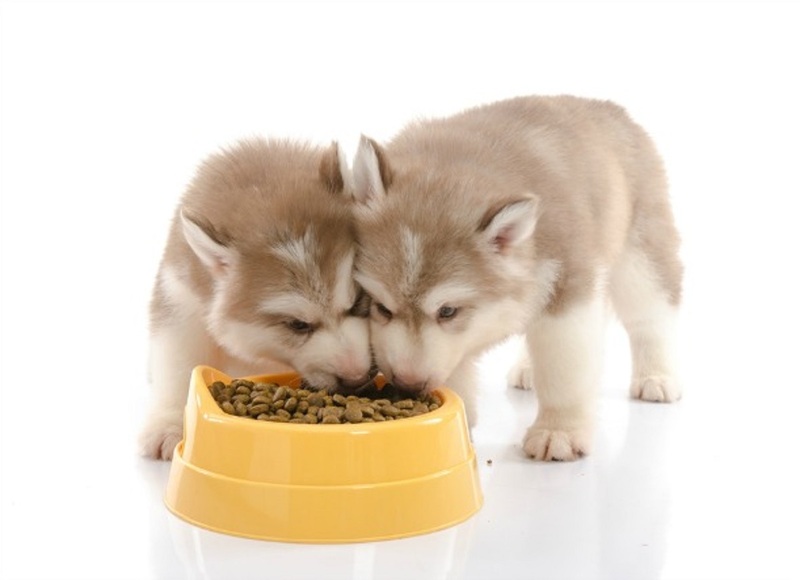 • When making a choice between wet and dry food many breeders, vets, and seasoned pet owners suggest that you mix the two to get the best of everything. Vets further recommend that dry food should be preferred as this gives the puppy the chance to develop his jaw muscles but if your puppy is teething and is having trouble eating, you might want to give him wet food for the time being. • Many vets will also recommend premium dog food rather than commercially prepared food that you can find at the supermarket and pet stores. They are quite expensive but they are good for puppies because premium brands do not contain artificial ingredients, chemical preservatives, and fillers. • To be sure of the food ingredients why not make homemade food for your pup? There are a lot of recipes all over the Internet which really are fun and very easy to do. This is a great way to show your love to your pet as well as allows you to save money. • When you decide on feeding your puppy with homemade food, be sure that your food does not contain bones because experts say that eventually, bone fragments will get stuck on his teeth or throat causing your puppy great discomfort. Also be sure not to include food that is harmful to puppies such as avocados, chocolates, and more. See your vet or surf the Internet for more information regarding this. By taking the time to do careful research and investigation you will be able to find the best dog food for that new pup you have and by doing so will lay the foundation of good health for your pet.